Hello, Celest and David here. It has come to our attention some people are desirous and want more direction on what to talk about, what to do and how to do it during their Gatherings so we have come up with a few ideas and suggestions which may be of use. You can talk about philosophy, love and kindness and acceptance. Talk about personal responsibility and passionate detachment. And discuss things that you as a group can do to accomplish your goals. If you do not have any then toss around ideas and see if you can find that which you feel you have within your power to change or empower. If you have The God Books you may choose to read a passage and then see where the conversation takes you. Talk about life, talk about death, reincarnation and what happens after a person leaves their mortal existence. Share your thoughts on why we are all here and what our collective missions are as well as to help other find and define what their individual missions may be. Talk about current events and help others to see and understand what is occurring, what is in need of change and why. You may choose to keep your Gatherings strictly on a Spiritual level or you may want to diversify your subject matter to help others to build a stronger Spiritual foundation in their everyday practical lives. Teach people about finding their center and being able to maintain this even as the world around them seems to be spinning out of control. Teach them how striving to find balance in their lives is incorrect and why they should have been focused on finding their center. Think about this for a while and you will see how it makes sense to readjust one’s outlook, one’s perception, one’s beliefs to find their center, rather than to be trying to balance the different aspects of their lives instead of eliminating the balancing act altogether and place everything front and center. The center is much like being in the Eye of The Strom. And as you have all learned from what God and the other Luminescents have shared, is that God IS, the Luminescents ARE the Eye of The Storm. How does one find their center? Can one survive by being whole and complete, not dependent upon others for self approval? Can one live without drama in their lives? Can one be their own best friend first and attend to your own best interests first and not feel guilty about doing so? Teach people about the power of words and thoughts and how to properly focus them to do the most good. You can also discuss how planetary and Universal energies and the collective consciousness affect people. You can also come together and perform PUSH movements. The list goes on and on. Other suggestions for subject matter may include: Nirvana and Life in the Hereafters. What, why, and who are Advocates for Justice and The Advocacy Program. Indelible fingerprints, Understanding I AM, understanding The Seasons of the Soul. Teach about often bandied about but not truly understood terms such as Love, Light, Spirituality and the need for people to find their own purpose for being and how there is no need to be mimicking others. In other words, how our unique individualities define and unite us and how collectively we complement and enhance each other. You can teach people how to quiet their minds, how to find, maintain and strengthen their own sentience and learn how to listen to their Soul Voice and to start trusting their intuition. Explain how their intuition is Soul Voice speaking to them. You may also want to discuss what is happening in the environment. You could teach each other how to grow your own vegetables and how to store them properly. With the unpredictable nature of the world’s economies, the political arenas, the ever-changing weather conditions there are many things to be considered. Teach others to understand their dreams, how to decipher them and how to properly ask for information to be given to them. Think about things you yourself have over time come to understand and share your revelations no matter how small or seemingly insignificant. Everything is important if the information is presented properly. Show people how they may be inadvertently contributing to the disorganized chaos through thoughts and everyday actions which they may not have ever considered before. There really is no limit to what can be done with your gatherings. Maybe you are into song or art or other forms of expression and can help others to find other means to express themselves. Teach people about their new Light bodies and how it is a naturally occurring event and why they may not need to dwell too much and wonder if they are changing. Conspiracies are great IF you only use them as a catalyst to show others how to see behind the scenes and decipher truth from illusion. Teach them how to understand GOD CODE and how it is not only used by God but by all others in Divinity as well as in the visions everyone has during their dream states. Your Gatherings can be held in your home IF you feel comfortable doing so. Or you can choose a neutral place to come together. During the sunny days you may want to consider meeting in a park or at a coffee shop. We do suggest you pick a place where others will not be able to overhear your conversations. This could be counterproductive if others do not share your perspectives. You may also choose to use other types of venues available to you which you either feel comfortable with or those you feel may be the most effective. If you are not able to gather in groups physically you may choose to use alternative means to contact others like yourself. There is Skype to consider and other options like Skype. There are internet conferencing as well as internet radio programs which can also be utilized. We are not a big fan of Facebook or online forums but many others are and use them regularly and they be quite effective IF you monitor the responses, the exchanges and moderate or block the “unfriendly” or those who are trapped in illusions and dramas and are causing disruption in your sharing, in your Gatherings. 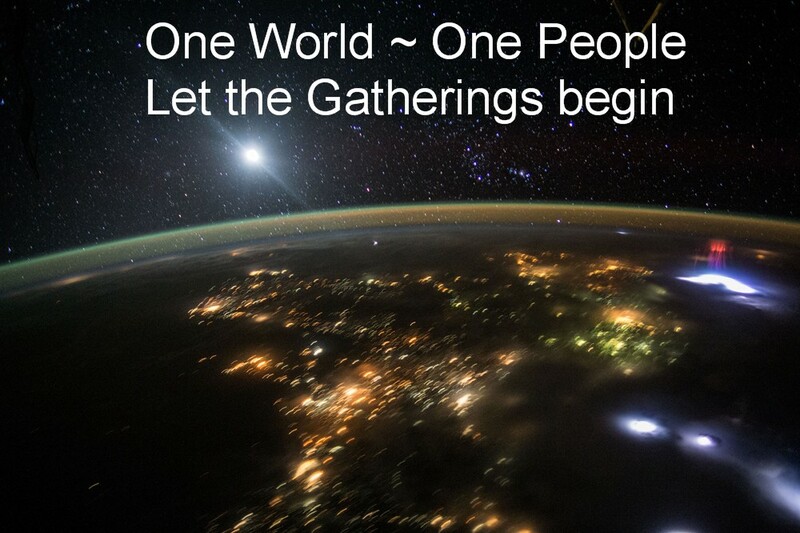 If you belong to other groups share with them the new Gatherings you are Creating or belong to. If you have websites or know others who have a website ask them to share the information with others. And please choose an alternative email address which you can use for your communications, one that is separate from your everyday communications. This is important. There is no need to send information to people who do not understand or believe as you do. We know that to some of you this is all new and you may be feeling a little bit nervous about stepping forward and taking a Stand and this is ok. Moving into unchartered waters is not always easy. Not everything in life is. We will also remind you that nervousness is another aspect of fear and fear is NOT a natural response or expression of Soul. So we encourage everyone to EXHALE and think, “I am calm, serene and tranquil. I, as the expression of My Soul can learn anything if my intents are pure and unbiased.” Now, do you feel better? Let us know if you have any other questions or have comments which may be beneficial to others. We will post your updates and email contact information as you share them with us.